The McLeavey chaise - OTN | STUDIO ETC. Among all the stories surrounding Peter McLeavey one has a special resonance. In Jill Trevelyan’s book on the life and times of the dealer, Richard Killeen who happens to be one of his artists, recalls this story as “a classic" that “people still talk about.” He added that “Peter told the story so well…” but, as with all well told stories, there's usually more than one version. This is another one. The story begins in July 1991 when Peter McLeavey wrote to invite the artist now known as Lillian Budd to show with him. 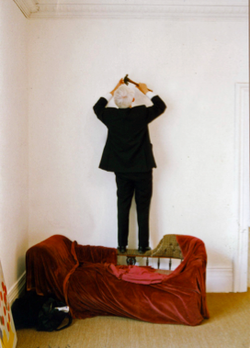 “I would like to show your work; and handle it and sell it from my gallery…” Later in the year McLeavey suggested she put up an installation in his space to be shown over January and February 1992. The request was an unusual one. Like most other dealer galleries in NZ McLeavey usually closed for the first couple of months of the year. He explained that he was changing things around and would like to have something to show clients over that period. 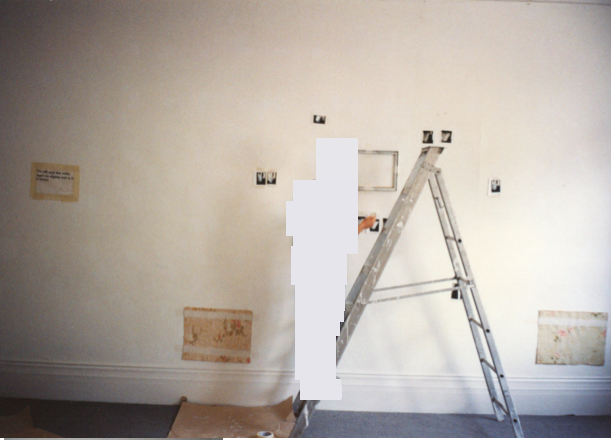 Budd installed the work on the wall directly opposite the main door to the gallery and returned to Auckland. She had no response from McLeavey to the work but did do a bit of promotion for the installation distributing cards pitching the show to “genuine art lovers please”. 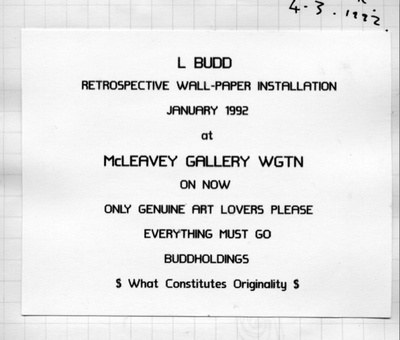 Eventually Budd would discover the work had been taken down and never seen by visitors to the gallery. Later some items from the installation were collected together in a writing satchel she had ‘blonded’ and were re-presented as a new work by Lillian Budd [she was clean shaven, nervous but ...] to mark the event. 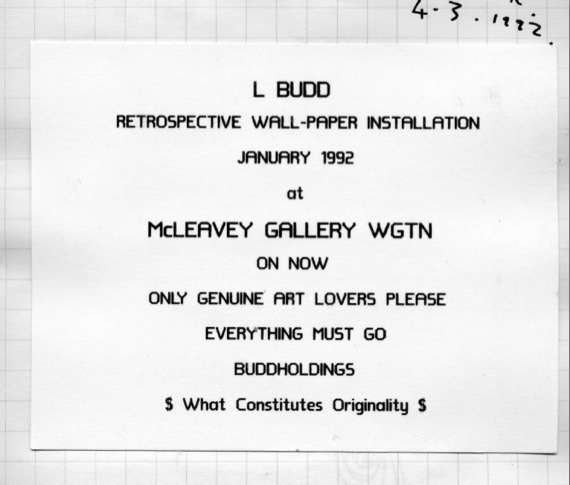 Later in 1992 McLeavey made contact with Lillian Budd again, this time with an offer for a solo exhibition and the artist agreed to create a work on behalf of Merit Gröting. 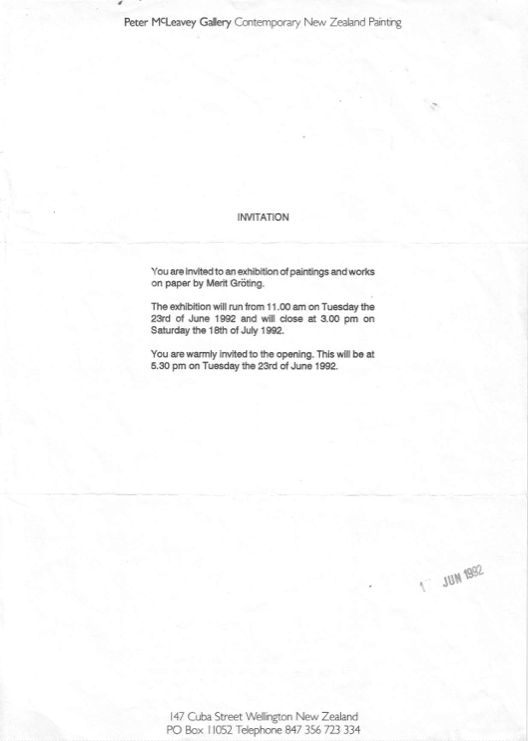 The exhibition dates for the Gröting show were set for 23 June to 18 July. Before the artist left Auckland McLeavey was in touch to tell her that he would not be at the gallery during the installation. He explained he had decided to spend the weekend with his family at their batch in the South Island. Arrangements were made to leave a key to be picked up from the fruit shop below the gallery. 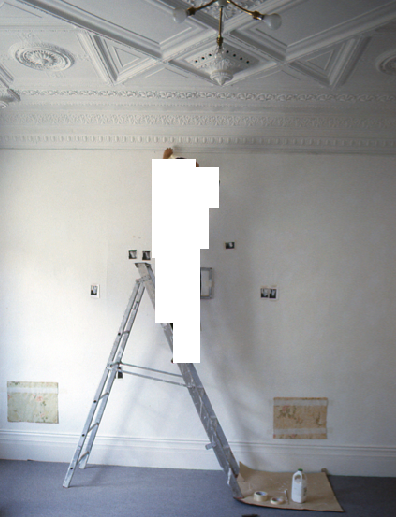 On the Friday before the 23 June opening Budd travelled to Wellington to install the show staying with Jim Barr and Mary Barr. The key was at the fruit shop as promised and on Saturday Budd together with Jim Barr opened the front door. In the landing outside the gallery door the usual stacks of crates were found along with Peter McLeavey’s desk. its top was covered with a sheet of newsprint. Inside the gallery there was nothing except for the chaise lounge in the main gallery and in the office/gallery a small pile of old newspapers topped with an unopened four litre can of Taubman's Ceiling White paint and a brush. As we learn from Jill Trevelyan's book, the chaise was part of 147 Cuba Street’s fixtures and fittings from day one. It was given to McLeavey by his flat mate John Gannaway who had inherited a house full of Victorian furniture. 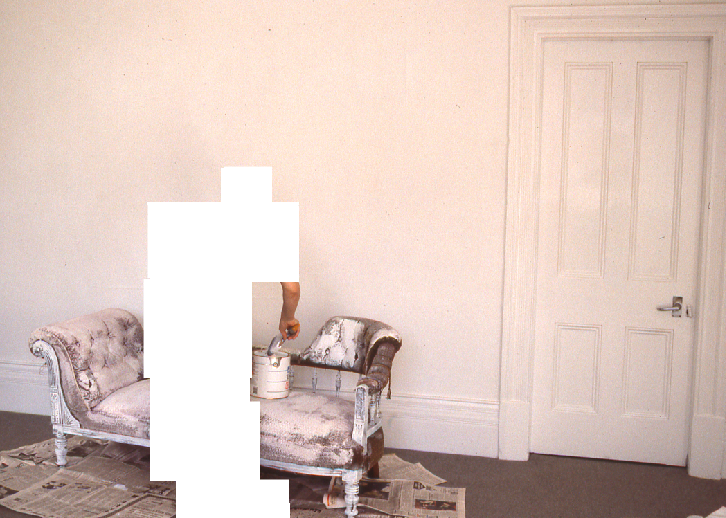 There is a 1969 John B Turner photograph of Hilary McLeavey sitting on it with Peter McLeavey standing beside her and indeed the chaise appears ten times in whole or in part in photographs throughout the Trevelyan book. It was definitely part of the setting, character and associations of McLeavey’s complex brand. In the McLeavey way it had been allowed to grow old without intervention like the nail hole pocked walls, shabby stairs and worn carpet. Once it started to leak stuffing it was draped with red satin fabric to hide the wear and tear. By 1992 it had been in the gallery for nearly 30 years. The blonding of the chaise longue in the Peter McLeavey Gallery didn’t take as long as you might imagine. The newspapers were put to use protecting the sisal floor covering, the lid laboriously opened with a 50 cent coin, the brush loaded up and a few photographs taken of the operation in progress. It has to be said that while the paint quickly soaked into the material the blonding process didn’t exactly cover so much as claim. 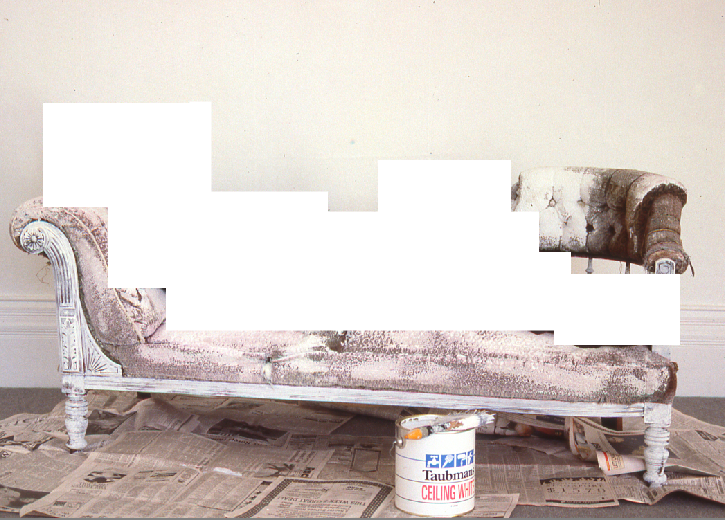 When the painting was done: a couple more photographs channeling Goya’s Maja on the chaise, cleanup, lock-up and off. Nothing really. There was no word from Peter McLeavey on the Monday but about 8am on Tuesday he rang Budd at Jim and Mary’s to say the exhibition was cancelled, he was taking the show down and would put it on a truck back to Auckland. And he did.